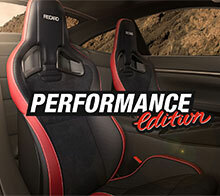 Stay sporty: straight from the exclusive interior of powerful performance vehicles comes our new RECARO gem for your office. Looks like carbon. Is actually leather. The elegant finish of our Office Sportster CS “Performance Edition” swivel chair will attract everyone’s attention. White contrast stitching and bright red strips of leather emphasize the excitingly dynamic contours, while jet black Dinamica in the backrest underlines the unmistakable RECARO design. 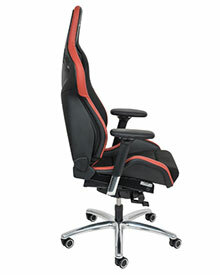 First-class ergonomics and body support included. 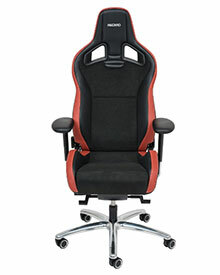 To secure RECARO's black-red-and-cool beauty to enhance your office interior, don't delay! 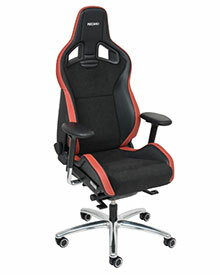 The “Performance Edition” Sportster CS chair is being made in limited numbers only. The latest gem from RECARO Automotive Seating‘s sports seat collection bears the name Sportster CS "Performance Edition". It excels with a unique highlight: finest attention-grabbing carbon-look leather on the headrest and side supports. White contrasting stitching and bright red strips of leather emphasize the excitingly dynamic contours, while jet black Dinamica in the headrest underlines the unmistakable RECARO design.